Have you ever wondered what your smile might look like if that missing tooth wasn’t missing? Dental implants are an effective way to permanently replace missing teeth with one that looks just as natural. They are used as an alternative to dentures and bridges because they are non-invasive to your existing teeth. Dental implants are an excellent option for long-term smile restoration. If you’d like to enhance your smile and improve your self-esteem, we’d like to help. 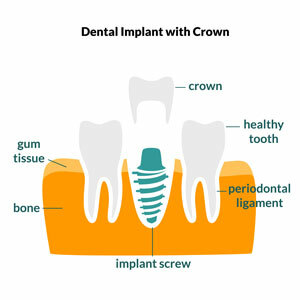 Contact us today to book an implant consultation and see if dental implants are right for you!